Matthew 5:23,24, "Therefore if thou bring thy gift to the altar, and there rememberest that thy brother hath ought against thee; Leave there thy gift before the altar, and go thy way; first be reconciled to thy brother, and then come and offer thy gift." Mark 11:25, "And when ye stand praying, forgive, if ye have ought against any: that your Father also which is in heaven may forgive you your trespasses." In the Bible, prayer is amazingly interwoven with love and forgiveness. Such statements as these come from the scared Scriptures, "And forgive us our debts, as we forgive our debtors." (Matthew 6:12) "But if ye forgive not men their trespasses, neither will your Father forgive your trespasses." (Matthew 6:15) "So likewise shall my heavenly Father do also unto you, if ye from your hearts forgive not every one his brother their trespasses." (Matthew 18:35) "And be ye kind one to another, tenderhearted, forgiving one another, even as God for Christ's sake hath forgiven you." (Ephesians 4:32) "Blessed are the merciful: for they shall obtain mercy." (Matthew 5:7) Notice the theme of these Scriptures: If we ask forgiveness, we must give forgiveness. If we ask mercy, we must be merciful. In other words, for a Christian to know the fulness of his prayer life, he must have love in his heart for his fellowman. I John 4:20, "If a man say, I love God, and hateth his brother, he is a liar: for he that loveth not his brother whom he hath seen, how can he love God whom he hath not seen?" 1st John 3:18-21, "My little children, let us not love in word, neither in tongue; but in deed and in truth. And hereby we know that we are of the truth, and shall assure our hearts before him. For if our heart condemn us, God is greater than our heart, and knoweth all things. Beloved, if our heart condemn us not, then have we confidence toward God." I John 3:23, "And this is his commandment, That we should believe on the name of his Son Jesus Christ, and love one another, as he gave us commandment." Matthew 5:7,8,22,38-48, "Blessed are the merciful: for they shall obtain mercy. Blessed are the pure in heart: for they shall see God. But I say unto you, That whosoever is angry with his brother without a cause shall be in danger of the judgment: and whosoever shall say to his brother, Raca, shall be in danger of the council: but whosoever shall say, Thou fool, shall be in danger of hell fire. Ye have heard that it hath been said, An eye for an eye, and a tooth for a tooth: But I say unto you, That ye resist not evil: but whosoever shall smite thee on thy right cheek, turn to him the other also. And if any man will sue thee at the law, and take away thy coat, let him have thy cloke also. And whosoever shall compel thee to go a mile, go with him twain. Give to him that asketh thee, and from him that would borrow of thee turn not thou away. Ye have heard that it hath been said, Thou shalt love thy neighbour, and hate thine enemy. But I say unto you, Love your enemies, bless them that curse you, do good to them that hate you, and pray for them which despitefully use you, and persecute you; That ye may be the children of your Father which is in heaven: for he maketh his sun to rise on the evil and on the good, and sendeth rain on the just and on the unjust. For if ye love them which love you, what reward have ye? do not even the publicans the same? And if ye salute your brethren only, what do ye more than others? do not even the publicans so? Be ye therefore perfect, even as your Father which is in heaven is perfect." The general theme of all these passages indicates that the degree of success that a Christian enjoys in his prayer life is dependent to a great extent to the degree of success he enjoys in his love and forgiveness life. Now this does not mean that a Christian who finds it difficult to love someone can never have a prayer answered; that is, all other things being in order in a Christian's life. In Matthew 5:23,23, and Mark 11:25 God seems to give us a divine order concerning love and prayer. 1. Giving. Notice that when a person comes to the alter and realizes that his brother has ought against him, he is not to take his gift back with him as he seeks reconciliation to his brother. He is to leave his gift at the alter. This does not mean that a person is exempt from giving because his brother has ought against him. It merely teaches the matter of priority. Both giving and reconciliation are important, but reconciliation is more important. However, neglecting one does not give license to neglect the other! 2. Praying for personal needs. Even in this model prayer Jesus places "Give us this day our daily bread," before he mentions "forgive us our debts." God takes care of His own people as far as their daily needs are concerned not because they are good children, but God feeds us because they are His children. The degree and quality of His provision may depend upon our being good children, but God feeds us because we are His own. He feeds us not because of our condition but because of our position. In the wilderness the children of Israel were backslidden. They had come to Kadesh-Barnea and had refused to enter into the door of the Promised Land. Because of this, God punished them and cast them into the wilderness for 40 years. Those over age 20 died and never got to see the Promised Land. In spite of this, God fed them. Every morning He dropped manna from Heaven (It is called "angel food" in the Bible.) in order that these backsliders might be nourished. He gave them water from the rock and preserved their clothing and their shoes for 40 years. All of this was done in spite of the fact that they were backslidden and had refused to obey the will of God. When Elijah ran from Jezebel and hid under the juniper tree with a depressed and defeated spirit, he was backslidden. He was outside the will of God. He was complaining. He was fearful and yet God sent him food in a miraculous manner. God did not feed him because he was being a good child but because he was His child. Elijah's condition did not bring him food; his position brought him food. When Jonah was called by God to go to Nineveh and preach repentance to them, he refused to go; instead, he went to Joppa and there caught a ship for Tarsus. He was cast off the ship and was in a backslidden condition, being outside of the will of God. Yet God protected him. The great fish swallowed him and he was protected. In none of these stories were God's people the objects of lavish provisions. God did not drop filet mignon, a baked potato with sour cream, a combination salad and pecan pie out of Heaven in order to feed the Israelites, but He did feed them. God did not deliver prime rib and a chef's salad to Elijah, but He did feed him. God did not provide Jonah with the presidential suite at the Hilton, but He did protect him. A good parent may spank his child when he misbehaves, but he will not starve him. 3. Being reconciled to those against whom we have ought. Mark 11:25, "And when ye stand praying, forgive, if ye have ought against any: that your Father also which is in heaven may forgive you your trespasses." This means that the Christian should be sure there is nothing in his heart against anyone. Notice this far in this little outline we have advanced, nothing has been said about big praying—praying for the power of God, asking for miracles, etc. These cannot come if our hearts are not right with others. One cannot hate the body of Christ and expect his big prayers to be answered. One cannot hate the bride of Christ and expect to receive miracles in answer to his prayers. In mistreating God's people, we mistreat Jesus. He Himself said, "Inasmuch as ye have done it unto one of the least of these my brethren, ye have done it unto me." (Matthew 25:40b) Any parent understands this. A good deed done to one of his children is a good deed done to the parent. When Saul of Tarsus (later to become the Apostle Paul) was smitten on the road to Damascus, he asked, "Who art Thou, Lord?" The response was, "I am Jesus Whom thou persecutest." (Acts 9:5) Paul was not persecuting Jesus, and yet he was, because Paul was persecuting His people. Jesus was saying, "When you persecute My people, you persecute Me." "When you hurt My people, you hurt Me." "When you would My people, you would Me." "When you slander My people, you slander Me." "When you mistreat My people in any way, you mistreat Me." Rest assured that God will not allow a Christian great power in prayer until bitterness, hatred, envy, jealousy and strife toward others are emptied from his heart. 4. Receiving big answers to his prayers. Now that the heart is right toward others, God is more favorable to turning His ear our way and to responding to our requests for more than food and raiment. Ah, 'tis a wonderful thing to see God work in mighty power! On a recent Sunday night a father brought with him an infant son to my office and asked if I would anoint him with oil and pray for him. The doctors had discovered that he had a hole in his heart. I anointed the baby and we earnestly prayed for God to intervene. The very next day the father took his son to the doctor, extensive tests were run, and the doctor told the young man that the hole in his boy's heart had been closed and there was no sign whatsoever of any heart condition. Praise the Lord! God has so many answers to prayer available for us, but He will not answer us abundantly until our hearts are right with others. Our son, Dave, and his wife, Paula, wanted to have a child. Paula had some disease that prevented conception, so Dave asked me if I'd keep my eyes open for a baby they could adopt. God answered our prayer concerning this and the way was cleared for the adoption of what was to be a precious daughter. However, before the baby was born that they were to adopt, Paula came to my office and told me that she was so happy that they were going to adopt a child, but through tears she said that she really hoped and wished that in addition to the one they were going to adopt she could have one of her own. I got the little bottle of olive oil that I keep in my office and anointed Paula's brow with oil. We prayed for God to open her womb and to give her and David a child of their own. Before the child that they were to adopt was born, Paula was expecting her own baby, and God marvelously and miraculously allowed her to deliver another sweet little girl! God answers prayer! God answers big prayers, but our hearts must be right! Of course, there are other things that can prevent God answering prayer, such as a lack of faithfulness to God's house. Proverb 28:9, "He that turneth away his ear from hearing the law, even his prayer shall be abomination." Refusing to give God the tithes and offerings will close the windows of Heaven and prevent the type prayer life that God wants to give us. Malachi 3:7-10, "Even from the days of your fathers ye are gone away from mine ordinances, and have not kept them. Return unto me, and I will return unto you, saith the LORD of hosts. But ye said, Wherein shall we return? Will a man rob God? Yet ye have robbed me. But ye say, Wherein have we robbed thee? In tithes and offerings. Ye are cursed with a curse: for ye have robbed me, even this whole nation. Bring ye all the tithes into the storehouse, that there may be meat in mine house, and prove me now herewith, saith the LORD of hosts, if I will not open you the windows of heaven, and pour you out a blessing, that there shall not be room enough to receive it." Suppose that once a week someone came to your house and committed robbery. Would you support him? If he asked you for some special favor, would you grant it? Of course you wouldn't, and neither will God. An impure thought life will hinder our prayers being answered. Psalm 66:18, "If I regard iniquity in my heart, the Lord will not hear me." These are just a few of the many hindrances to prayer mentioned in the Word of God, but high on that list is being wrong with others. 5. Being right with those who have ought against us. Matthew 5:23,24, "Therefore if thou bring thy gift to the altar, and there rememberest that thy brother hath ought against thee; Leave there thy gift before the altar, and go thy way; first be reconciled to thy brother, and then come and offer thy gift." Of course, this is not as great a sin as having something in our hearts against someone else. It is something that is vital in the life of every Christian. At first glance, one would wonder why would the person whose heart is clean be commanded to seek reconciliation with the one who has ought against him? God in His omniscience knew that if two people were estranged, the more spiritual of the two would come nearer initiating reconciliation. He did not place this in the same area of importance as getting your own heart right, but it is important! Even if reconciliation fails, we are supposed to seek such even if the animosity is totally on the other side. Of course, this is just being Christlike. When man's fellowship with God was broken, immediately God announced that He would seek reconciliation. Genesis 3:15, "And I will put enmity between thee and the woman, and between thy seed and her seed; it shall bruise thy head, and thou shalt bruise his heel." In the entire Bible is a marvelous love story telling how God, Who was sinned against, has done everything within His justice to seek reconciliation with man, the guilty party. Would you be Christlike? Then seek to be reconciled to those who hate you. Not only are we to love our enemies, pray for those that despitefully use us, bless those that curse us, love those that hate us, do good to those who do us evil, but we are to seek reconciliation actively with them. 6. Fellowship with God. This is the great bonus for seeking reconciliation with those who have ought against us. God will answer prayers before He will give us intimacy with Himself. The dear Lord seems to say, "If you will try to be reconciled with those that hate you, then I can relate to you because I did the same thing, and since the two of us are agreed, we can walk together, and I will give you a closer walk than you have ever known, a sweeter fellowship than you have ever known." There are three forms of communication with God mentioned in this little outline—praying for our personal needs, praying for big answers, and having intimate fellowship with God. Notice right before each there is something that we are to do. Before praying for our personal needs, we are to give. Before praying for big answers, we are to be sure that we have made it right with those against whom we harbor ill will, and before we can have intimate fellowship with God we are to seek reconciliation with those who have something in their hearts against us. A preacher recently asked me, "How does your fire stay burning? Every time I hear you preach, you light my fire. Now what lights yours?" I immediately replied, "The act of love." I said, "It is the setting of some time each day during which you think your way into the lives of others." What is love? Love is a college student dwelling on a middle-aged man who once was young and handsome and heard that a baby was coming. He called the insurance company and made plans because he wanted the baby, who is now the college student, to have what he never had. He saved and worked and was a buddy to his child even though he was weary when he returned from work daily. When the child because a teenager, the man wasn't prepared for it. He was lonely during the years of gradual severance. Soon the child grew up. (Too soon!) That middle-aged man still goes to work but his incentive is different now. He is sending a check every month to a college for the education of one for whom he has worked for years. Love is sitting in a college dormitory and thinking about Dad, loving him and thanking God for him! Love is remembering a young person dwelling on a middle-aged woman who carried that young person in her own body. She was so pleased when you came. It seemed then like eighteen years were forever. Forever now has come! She looks at your picture and remembers. Your room is a sanctuary. Your empty chair at the kitchen table is now an alter. Love is calling Mother and saying, "I appreciate every meal, every moment of toil, every truth that you taught." Love is thinking about her, remembering her! What is love? Love is dwelling on a preach who for years has made a small salary, who has no retirement plan though retirement is so soon. He has no house that is his. He has no close friends that he has made because he changed churches several times during his ministry. He has no way to explain his side when criticized. He is sincere but often misunderstood. He has no pastor. He is not well known. His heart is often broken by those who have stumbled. Love is pausing to thank God for your pastor and to think of him, even into his life. What is love? Love is thinking about a grandmother who doesn't feel attractive anymore. She doesn't feel needed. She sits by a telephone which refuses to ring. She visits a mailbox daily which refuses to yield a letter. Her roommates are pictures; her dreams are memories. She always feels a little bit that she is "in the way," and she wonders how near the rest home really is. She wonders if you ever think of her. Love is when you pause to think, to think regularly, to think daily of Grandmother! Love is a long distance phone call that would excite her beyond compare. What is love? 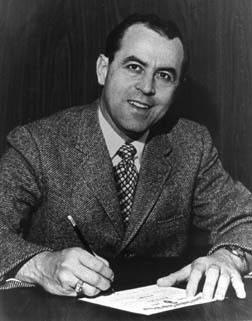 Love is Dr. Jack Hyles sitting in a motel room thinking about his people, hoping they are happy; praying that the college students and the high school students and the grade school students can stay in school; wishing that he could be a part of each family, hoping you know he loves you; realizing you have it rough, hoping your room is warm, thinking of your burdens, wishing he had more time with your family; rejoicing when you serve Jesus, hurting when you go astray; thinking about the working men, praying for the busy mothers, asking God to watch over the little children. Love is a pastor taking time regularly to perform the act of love; that is, setting some time each day during which he thinks his way into the lives of his people. What is love? Love is a person wanting to see another's needs filled and wanting to be the one who fills those needs and wanting that person to fill all of his needs. Yet, love is more than that. What is love? Love is the doorway through which the human soul passes from selfishness to service. Yet, love is more than that. What is love? Love is the key to the universe which unlocks all its doors. Love is that which gives its all yet still has more to give. Yet, love is more than that. What is love? Love is that which causes us to look at another's faults through a telescope and at our own through a microscope. Yet, love is more than that. What is love? Love is the medicine that cures all hatred, malice, envy and jealousy. Yet, love is more than that. What is love? Love is the marriage of the soul. Yet, love is more than that. What is love? Love is the divine vitality that enriches and restores like to mankind, strengthens the weak and lifts up the fallen. Yet, love is more than that. What is love? Love is the sacred flower plucked from God's garden of graces whose early bud is happiness and whose bloom is service and sacrifice. Yet, love is more than that. What is love? Love is not blind, yet because it sees more, it is willing to see less and volunteer blindness! Yet, love is more than that. What is love? Love is the essence of God given for the good of man that makes God's man like man's God. Yet, love is more than that. What is love? Love is that for which we were born and that which can make us in the hearts of others never die. Yet, love is more than that. What is love? Love is that which enables a wife to sing while she mops the floor after her husband has walked across it in his barn boots! Yet, love is more than that. What is love? Love is that which maketh halitosis sweet to the lover. Yet, love is more than that. What is love? Love is what Ingersoll called a "divine swoon." Love is that which hopes when reason despairs and cares when reason flees and forsakes. Yet, love is more than that. What is love? Love is the weapon that is needed to conquer rebel man when all else has failed and when wrath has swooned. Yet, love is more than that. What is love? Love is that which melts the winter of the heart whose thaw is as a smile of sunshine on the face. Yet, love is more than that. What is love? Love is the fuel for the vehicle of kindness, benevolence, compassion and mercy. Yet, love is more than that. What is love? Love is the raging river of emotion whose expression overflows its banks, whose tide cannot be stopped, and whose thirst is never quenched. Love is that menu which feeds the unlovely as well as the lovely, the unloved as well as the loved and the unloving as well as the loving. Yet, love is more than that. What is love? Love is selfishly unselfish, confidently jealous and quietly raging. Love is the ladder upon which man climbs to the heavenlies and reaches the graces. Yet, love is more than that. What is love? Love is the bridge between the land of the living and the land of the dead. Love is the greatest gift exchanged between mortal men. Love is the marvelous illness that has no cure or remedy whose germs make it delightfully contagious. Yet, Love is more than that. What is love? Love is the sunshine as midnight ands warmth in January. Yet, love is more than that. What is love? Love is the measuring stick of duty in service to humanity. Yet, love is more than that. What is love? Love is two hearts beating as one and two souls with a single thought. Yet, love is more than that. What is love? Love is a deed which ne'er knoweth repentance and needeth no remorse. Yet, love is more than that. What is love? Love is God's special gift to man alone which His other creatures cannot share. Yet, love is more than that. What is love? Love is that which binds heart to heart, mind to mind and soul to soul. Love is one heart betrothing another, the marriage of one soul to another, and a union of two minds. Yet, love is more than that. What is love? Love is the silver link and the silken tie between two hearts. Yet, love is more than that. What is love? Love is that sacred triangle between one's soul, his God and another which puts God first, others second and self last. Yet, love is more than that. What is love? Love is caring for a baby who through a toothless smile returns to Mother the food that he just ate. Yet, love is more than that. What is love? Love is lecturing a child who in one breath says, "I wuv you," and the next minute is holding that breath until he turns blue! Yet, love is more than that. What is love? Love is patient with the teenager who cleans his room to a high gloss one day and the next day leaves it looking like Pearl Harbor on December 8, 1941. Yet, love is more than that. What is love? Love is devotion for a wife who is as warm as an Alaskan stove one day and as cold as an Eskimo's igloo the next. Yet, love is more than that. What is love? Love is a wife's patience with her husband who spends an hour one day looking for flowers to put on the inside of the house and refuses to spend ten minutes a year chopping the weeds on the outside. Yet, love is more than that. What is love? Love is a bridegroom pursuing his new bride who yesterday left Mama to go with him and today leaves him to go to mama! Yet, love is more than that. What is love? Love is the parishioner's patience with a preacher who is an Apollos one Sunday and couldn't pass the high school speech class the next Sunday. Yet, love is more than that. What is love? Love is a teacher's patience with a junior boy whose horns protrude through his halo, for yesterday he put an apple on her desk and today he put a lizard in her desk! Yet, love is more than that. What is love? Love is a mother's care for a junior girl who is a combination of an angelic demon, a demon-possessed angel and a heavenly devil. Yet, love is more than that. What is love? Love is that rarest of the gems that is mined only in the depths of Heaven which combines the sapphire's gleam, the tint of the topaz, the diamond's sparkle, the emerald's beauty and the glitter of opal. Yet, love is more than that. What is love? Love is a constant vacation in paradise. Love is that holy flame fallen from Heaven to earth which returns to Heaven from earth. Yet, love is more than that. What is love? Love is a widow standing at a graveside and speaking to a departed husband, saying, "I would rather be your widow than the wife of any man on earth." Yet, love is more than that. What is love? Love is the paying of a debt that respect owes. Yet, love is more than that. What is love? Love is a tender plant nourished by meditation, musing and caring. Love is the soul orbiting in the vast space of service, sacrifice and selflessness. Yet, love is more than that. What is love? Love is that fountain of youth and tree of life that makes a little piece of dust called mortal man flirt with eternity and betroth deity. Yet, love is more than that. What is love? Love is a secure yawn, an eye twinkle, a speaking silence. Yet, love is more than that. What is love? Love is a mother saying, "I don't want any," and a dad on his way to work at daybreak. Yet, love is more than that. What is love? Love is that which makes two people thousands of miles apart watch a sunrise "together" at noonday and midnight. Yet, love is more than that. What is love? Love is just being there. Love is two hands reaching for the same popcorn. Yet, love is more than that. Though stretched from sky to sky." Maybe that person with his mind temporarily ill was saner than all of us, and maybe he understood more about love than the scholars. Whatever love is, when God's children know it, it is the key that unlocks the coffers of glory and propels the generosity of God to send needs and wants to His children which they have requisitioned of Him!